Hello. Not a traditional podcast but I thought I would post my latest "studycast". For each unit I do an audio review of the important material on the upcoming test. We have our Unit 4 test coming up on Friday over the American Revolution. I have done a studycast for each of the first three unit tests but had not yet mentioned one for this unit and today several students in several different classes asked if I would record one tonight for them. It was great to hear that the students do use it as a resource and that they were actually wanting to listen to it as a study guide. I added a little background music to spice it up - just listening to me ramble on is rather dry - and am anxious to hear comments from my students. My students are always very interested in discovering what types of music their teachers listen to on their own time. This is another example of me using the i-River MP3 player to create content for my students. I hope to allow for more student created content in the spring semester after Christmas. Yesterday I received some information about a great workshop opportunity from Linenwood University and the Missouri Department of Conservation. I don't think I will be able to attend because I am also an 8th grade basketball coach here at South Valley and it occurs on the same date but I wanted to pass along the information for other teachers who may be interested. The workshop is entitled: Missouri History and Western Movement. It takes place on January 28, 29 and 30th of 2006 at Lindenwood University in St. Charles, Missouri. The handout says: "Sign up and spend a weekend learning new skills and ideas to incorporate living history and outdoor education as a tool to enhance subject matter delivery and student learning in your classroom." Sample topics include, but are not limited to: Osage Indian Meal, Dutch Oven Cooking, Muzzle Loading Rifles and Bullet Molding, Living History, Wood Tools, Log Cabin Notches and Split Rails, Dugout Construction, Archaeological Survey and Flint Napping. The workshop is limited to the first 50 participants who sign up and college credit is available through Lindenwood University for 1 or 2 credit hours. The course without credit is $60. I could not find a link on the web for this workshop but you can contact Jim Duncan at (314) 301 - 1500. If anyone decides to do this workshop please let me know. I would really enjoy hearing how what you learned. Hello. I have several ideas for a podcast and plan to record one in the next couple of days but I have also been thinking a lot lately about adding more blog entries to "Speaking of History" that would interest other American History teachers. I would like to do a future podcast on some of the best videos and movies used to teach history. I know that social studies teachers get a bad rap when it comes to showing movies but I'll be the first to admit there are several movies I really love to show my students because they generate excellent discussion and do an amazing job of showing the time period. One of the movies I think every history teacher should consider showing it class is "The Crossing". This movie describes George Washington's crossing of the Delaware River to attack the Hessians at Trenton, New Jersey on Christmas Eve, 1776. 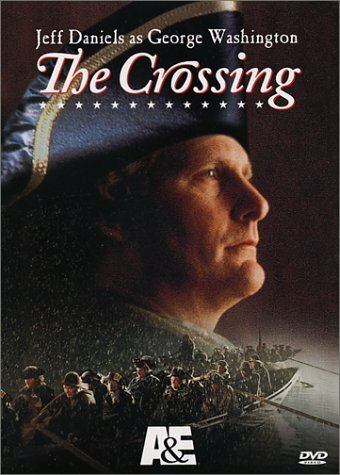 "The Crossing" was produced in 1999 by A&E and is available as on DVD and VCR tape. I would recommend the DVD since it also includes several special features you may want to share with your students. I love showing this video to my students because it shows George Washington as a person with flaws and yet his men believed in him. I think Jeff Daniels does an excellent job of playing George Washington. This video is a favorite of my students every year. We are currently in the middle of the movie and will finish it up on Monday. My students find it so incredible that not a single colonial soldier was killed in the actual fighting at Trenton - that is why I always tell them that many times history is more incredible than anything Hollywood could write as fiction.